Edouard Pignon, painter, mural painter, set designer and print maker, the son of a miner in Bully-les-Mines, near Lens. He left his village for Paris in 1927, and worked in car factories, attending evening classes at the Universite Ouvriere in painting and sculpture. In 1931, the effects of the Wall Street Crash were taking its toll on the French art market. He joined the Association des Ecrivains et des Artistes Revolutionnaires where he met Louis Aragon, Andre Malraux, Walter Benjamin. 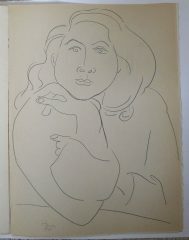 By the early 1930’s, Pignon earned his living as a lithographer and layout artist, he met Picasso in 1936. He was deeply impressed by Guernica in the Spanish Pavilion at the Paris World Fair. He himself was commissioned to paint a five-metre panel for the entry of the Pavilion des Anciens Combattants et Mutiles de Guerre. During the German Occupation, he became active in the Front National des Arts. He figured as one of the so-called ‘young painters of the French tradition’ at the exhibition in May 1941 at the Galerie Braun, a new way forward for French art during the war. After the war in 1949-50, being a member of the communist Party, he made a series of paintings about the official suppression of strikes and demands for better working conditions. It was post the Second World War that his generation of post-Cubists formed the core of the future School of Paris. His style departed from the official Socialist Realist style, becoming softer, more in the style of Picasso and Matisse. Pignon worked for Jean Vilar and Theatre National Populaire, designing costumes and sets. He had retrospectives in France in 1966 and 1970, and in Romania, Hungary and Poland in the 1970s. Pignon’s retrospective of 1985 at the Grand Palais was large and comprised of 216 works and with the giant ceramic sculpture commissions at Argenteuil. During his very last years, Pignon sadly lost his sight.